English Language and Comprehension section is necessary to clear, if anyone wants a Government job whether through SSC or IBPS. But, attempting this section in the exam, is hard nut to crack especially for Hindi medium aspirants. Many aspirants find it not a scoring section at all because of its poor accuracy, and leads to low score in the exam. - So, i have decided to discuss on this section and helped you guys to score in this section. I will discuss many points step by step so that it may help you in preparing this section. - I would first like to discuss the list of books which one may refer. 2. Plinth to Paramount by Neetu Singh: This book follows the SSC exams pattern and the topics are in dual language .i.e. English and Hindi. So, it's easy to understand for both language students to read this book. 3. Previous Year by MB publications: It consists of various Previous year question papers from English section only. There is compilation of Vocabulary and Idioms/phrases asked in the exam. 4. 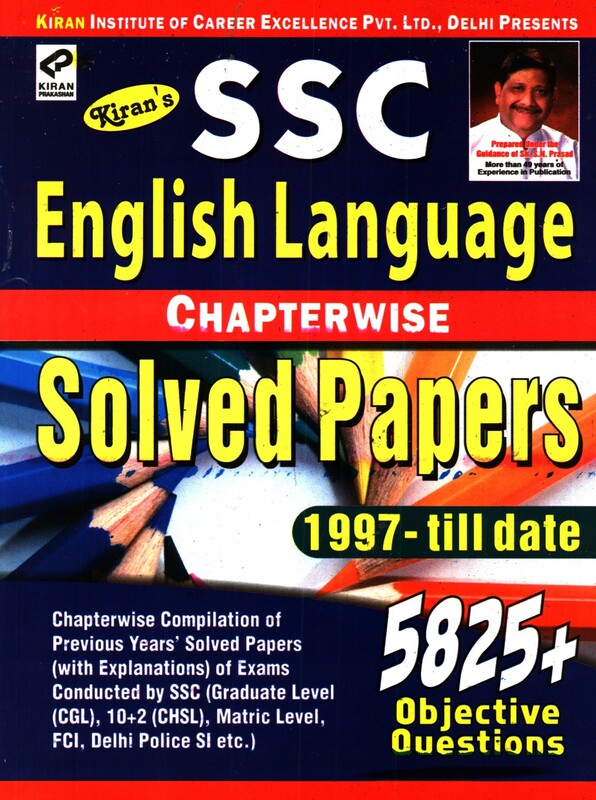 English Chapter-wise practice by Kiran Publications: It has compiled the questions from various topics asked in different exams. You will also find chapter on Synonyms and Antonyms; One word substitutions asked in previous year exams. 5. English papers by Spark Publications: This book is similar to MB publications and also focused on SSC exam pattern. You will Tier1 and Tier2 English section paper in Mock test format so that you can practice them. 6. Word Power Made Easy by Norman Lewis: This is the best book whose vocabulary is weak and wants to enhance. It provides various tips and tricks to learn vocabulary easily. - You no need to buy all books but for basics and different English Ruled, you can refer book no. 1 & 2. And for practice, book no. 3, 4 & 5 are enough and if you have time, you can buy them one by one after completing the previous one. You can also buy any book preferred by others but, rely on that if you don't like and don't hesitate to buy other one. In this, i would refer to practice more and more from different book or you can revise same practice book again to have better understanding. - Pattern of paper and what type of questions will come in the exam, should be known before preparing strategically. 'Strategically' means on which topics of English language and Comprehension. SSC exams: If you have gone through the previous year papers of Tier-1 exam, you must have noticed the different level of questions asked in the exams where find errors, fill ups, close test, one-word substitution, etc. SSC asks different level of questions in different exams and the toughest exam is considered to be CGL and CPO examination where English Test is also taken in Mains examination. So, you have to prepare it well to grab a job. However, English section of SSC exams consists of- 6 marks synonyms and Antonyms; 5 marks Spotting the error; 10 marks of Close test or Comprehension passage; 8-10 marks Sentence improvement; 4-5 marks Idoms/phrases; 2 marks Correct/incorrect spelling; 5-8 marks of One Word Substitution; 5-7 marks Fill ups; OR 5 marks each of Narration and Passive-Active Voice or both can be asked in Tier-1 exams. It totally depends on SSC which topics have to included. Banking Exams: English part of every banking or online exams remains the same. Only level of questions are changed for which post you have applied. In Banking the pattern of questions are similar to SSC, but still there is a slight change. As, the Comprehension passage is always asked in every exam and level of difficulty increses when you appear for PO or SO post. However, English section of Banking exam consists of- 5-7 sentence improvement; 10 marks Close test: 10 marks of Comprehension passage; 5 marks of spotting errors; 0-3 marks each of synonyms and antonyms; 5-7 marks of Fill ups; and Idoms/Phrases; 5-8 marks of Arrangement of Sentences or Jumbled Sentences; . - I would say, if you have time, you should equally devote on each topic of English Language syllabus and practice more and more to overcome your weakness and enhance accuracy. But, for better strategy, this thing should be understood that you don't have to waste the time on useless topics. - In SSC exams, you follow previous vocabulary, one word substitution and Idoms/Phrases asked would enough to score in any SSC exams. You know there are endless vocabulary and Idoms/Phrases and impossible to remember too. So, prepare accordingly to score in the exam as there is no sectional cutoff. And, for this you can refer books- Word Power Made Easy, Plinth to Paramount, and Previous year by MB Publications. - And for Spotting the errors, fill ups and Sentence improvement, you need study basic rules and concept and then, practice as much you can. - In Banking exams, there is sectional cutoff in every banking exams and also have to clear total cutoff. So, you have to attempt English section questions with good accuracy. For this, you can focus on Comprehension and Close Test as it weighs more in every test. Then, you can prepare for spotting the errors, sentences improvement and fill ups. These topics are common in both SSC and Banking test. So, it prepares you for both tests automatically. Books for GK section and study material to prepare. Comments "How to score in English language test of SSC and Banking exams"